Are you aware of all the new features in Microsoft Office 2010? Enrolling in an upgrade training course will take you through each of the programs; will show you exactly what changes have been implemented and also how to take full advantage of the new functionalities included. 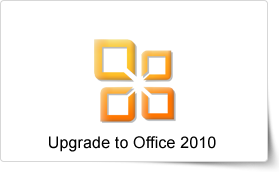 The Microsoft Office Upgrade 2010 training course of PD Training will give you a thorough introduction to the new features of this Office system to make you more productive and comfortable with the new interface. This fun, enlightening training course is available now throughout Malaysia and Kuala Lumpur. This Office Upgrade 2010 training course can be delivered at your premises by one of our expert local or international trainers or live online using our HIVE technology. This Upgrade to Microsoft Office 2010 training course running in Kuala Lumpur and Malaysia wide, covers those features of Microsoft Office 2010 that are new to the Office system, with dedicated units for the new features of each application. In Word, participants will learn to use the Navigation pane and apply new text effects. In PowerPoint they will organize slides into sections, edit movie clips, apply animation effects, and learn how to broadcast slide shows.